It’s certainly an awe-inspiring sight the first time you enter the great expanse of Hangar 17 at Launceston Airport and behold the gleaming distilling equipment laid out on the floor. It’s certainly not what you’d expect to find in Ansett Airlines’ long-neglected freight facility, until recently a lair for birds and dust. Thankfully the birds have been evicted and the dust laboriously scoured from the exposed metal girders to provide a home for Launceston’s first distillery in 175 years. 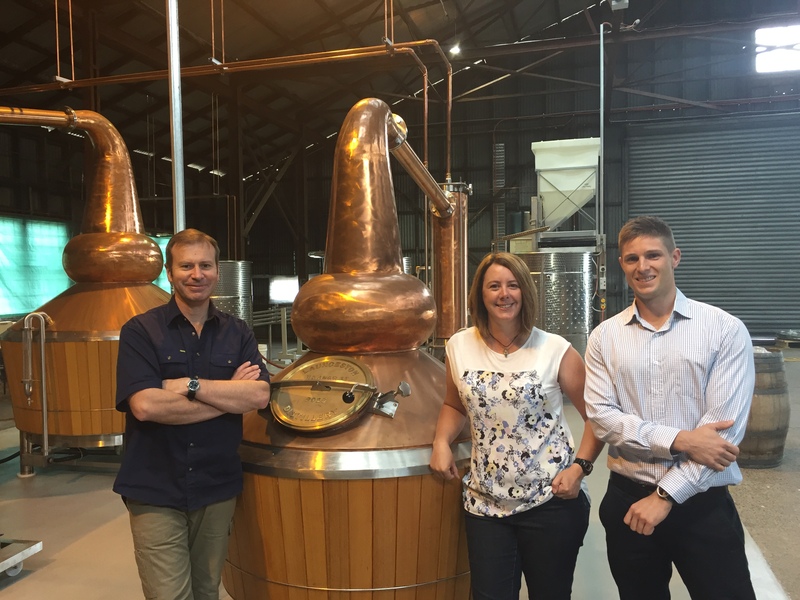 On a recent trip to Launceston the Whisky Waffle boys had the great pleasure of meeting Ilya, Peta and Chris, three members of the team, and checking out their state of the art distillery. 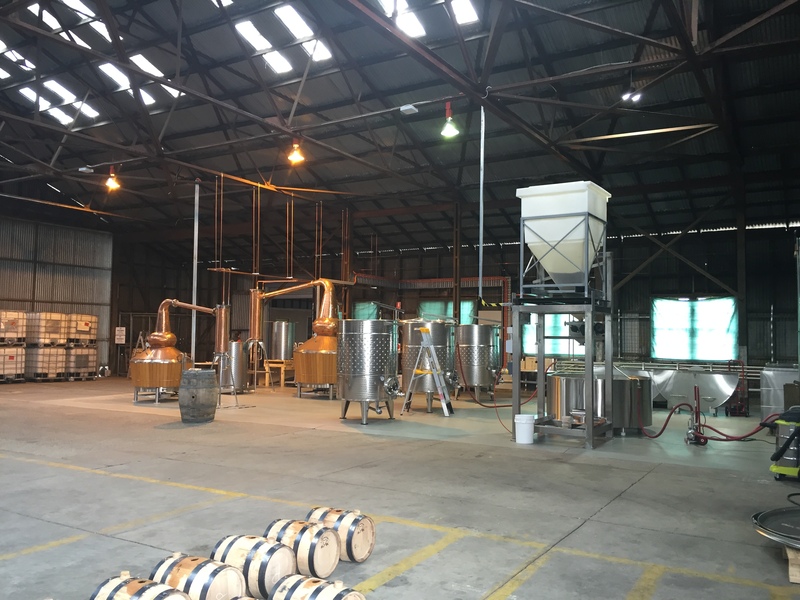 Their set up is certainly impressive: the stunningly beautiful Tasmanian-built stills stand proudly in the centre of the gigantic room. This is no small-scale operation – you can tell these guys are serious about their whisky-making, in part evidenced by the fact that they have both a wash still and a spirit still, often not the norm for smaller-scale ventures. 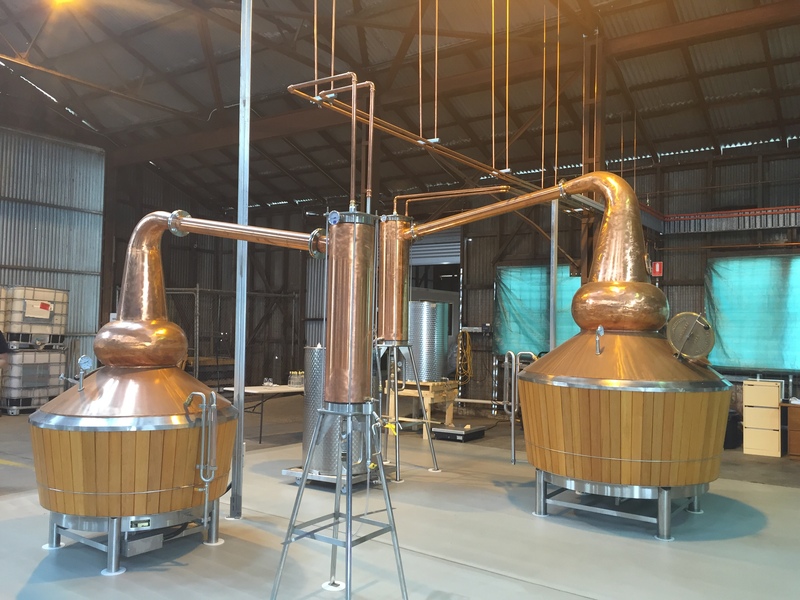 “We wanted to make a premium product,” said distiller Chris “so after much debate we came to an agreement and decided to take the plunge and build both stills.” Premium is certainly the goal they have set themselves and we think that they are well on their way to achieving it. This was made abundantly clear when we tried their new make – an elegant and dangerously drinkable spirit. As the team has only recently started filling barrels there was no whisky mature enough for us to try, though we did get to take a ‘flying visit’ through their bond store. Chris had three different casks on a table, an ex-bourbon, an ex-sherry and an ex-port and invited us to have a nose and see if we could guess which was which. We were unanimous about the bourbon but disagreed about the other two, with Nick’s nose reigning supreme on this occasion. Two good-looking pieces of equipment. And some stills. 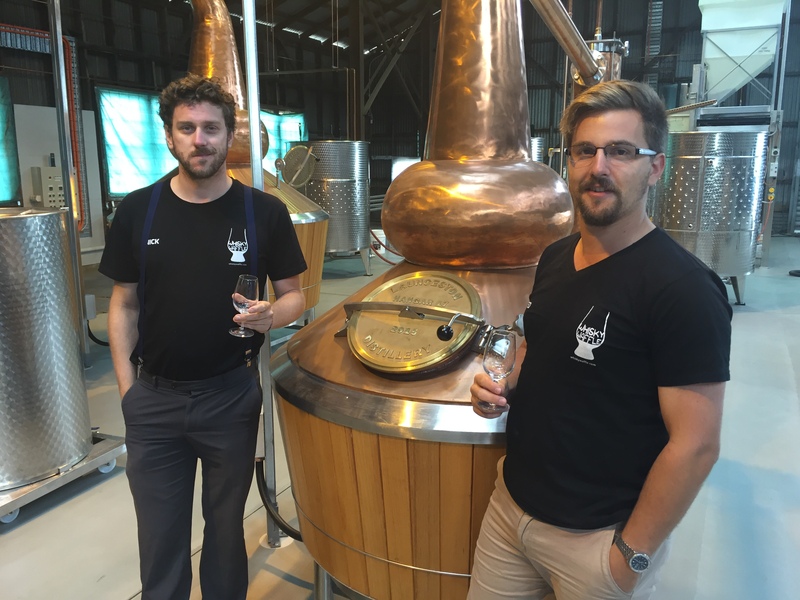 The Launceston Distillery crew are excited about being able to showcase their hometown and promote the northern part of the state. They are looking to capitalise on the success experienced by their southern counterparts and pave the way for a whisky trail in the north. Who knows, perhaps one day there will be a north-south rivalry develop in the whisky industry to mirror the Boags vs Cascade beer-battle. The dream team. Doing it for the North. L-R Chris, Peta, Ilya. 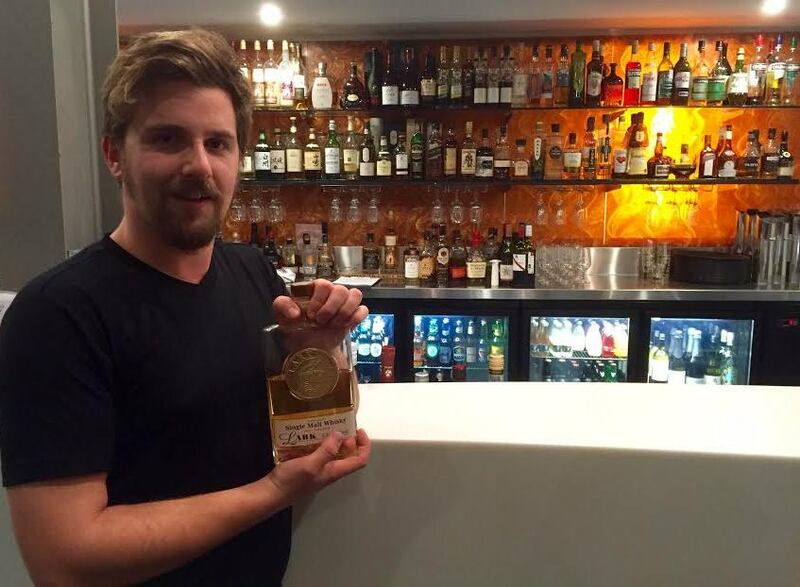 While at the moment the distillery is flying under the radar, and according to Ilya being consciously relaxed about publicity, they are certainly one to keep on the scanner in the future. We at Whisky Waffle are excited to discover the lofty heights they reach and will be booking our ticket when Hangar 17 is ready to lift off. 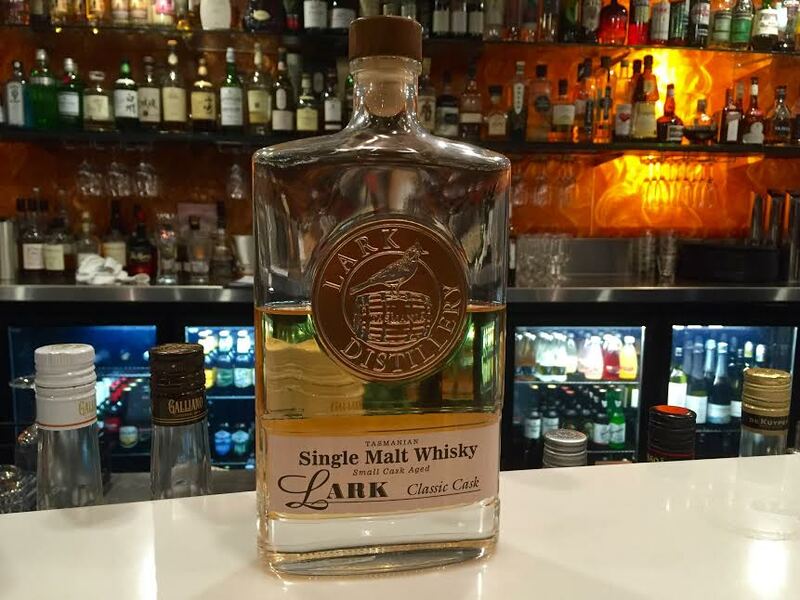 Find out more about Launceston Distillery at our links page. The distillery is not yet open to the public but appointments can be made to visit.